We have a fascination with images from the past. Places change over the years, but very often elements of what was there previously still remain, making these images both familiar and unfamiliar. They present a visual riddle for us to solve. We ask ourselves questions such as "are those buildings still there?" and if so, "what are they now?". This painting of North Plantation, St Peter Port, Guernsey, copied from an original photograph of 1880, depicts fascinating details of everyday life. The washing hanging out to dry, for instance, and the men outside working at the tin plate and zinc works of C. Foster. 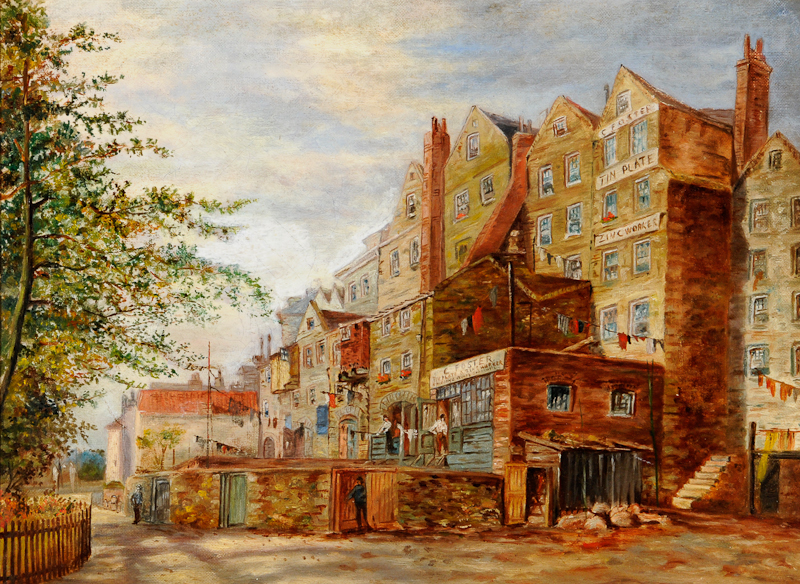 Can you identify exactly which buildings are depicted in this painting? Are they still there?